Mark your calendar to attend MDAFP’s 2019 Annual Meeting & Summer Summit! A great speaking opportunity awaits you! Are you, or is there someone you know, looking for an opportunity to present? The Maryland Academy of Family Physicians (MDAFP) is currently accepting proposals for presentations at its 2019 Annual Meeting and Summer Summit, scheduled for June 21 – 22, 2019 at the Renaissance Baltimore Harborplace Hotel. Proposals should reflect an interactive format (case studies, panel, Q&A, etc.) and be suitable for a 60 minute time frame. Presentations must be supported by evidence and support professional practice changes by attendees. All proposals must be submitted by April 18, 2019. ATTENTION: Students, Residents, and any member interested in showcasing your research. Posters needed for presentation at the MDAFP Annual Meeting and Summer Summit. Join your MDAFP colleagues at the 2019 Annual Meeting and Summer Summit at the Renaissance Baltimore Harborplace Hotel in Baltimore, Maryland. Share your work during our poster presentations, held during our MDAFP member reception on the evening of June 21, 2019. Network with Family Physicians from all over Maryland! This program is designed to be relevant to Family Physicians and other primary healthcare providers as they seek to meet their educational requirements and interests. The MDAFP must receive notice of cancellation no later than 21 days prior to first day of the course. Requests for full cancellations will be refunded less a $50 administrative fee. Cancellations or no-shows after this date are not eligible for a refund. To make a reservation with our discounted rate of $169+tax, please make your reservation online or call 1.877.212.5752 and mention you are with the Maryland Academy of Family Physicians group. The housing cutoff date is Thursday, June 6, 2019. After this date, the discounted rate is not guaranteed. A credit card is required at the time of booking to guarantee the room but will not be charged. 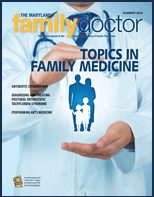 Reach medical students, family medicine residents, and Family Physicians. Increase brand recognition and exposure among Maryland Family Physicians and other primary healthcare providers. Gain visibility for your company and demonstrate your support of the industry.